Three US service members were killed and three others were wounded by an improvised explosive device near Bagram Airbase on Monday, April 8, the Resolute Support confirmed in a statement. One of the chief conditions of USA negotiators is that the Taliban cease all attacks on American personnel and end all support for terrorism. The wounded service members were evacuated and are receiving medical care, the statement said. The base in Bagram district serves as the main US air facility in the country. Col. Dave Butler, a military spokesman, said the man and other injured Afghans were taken to Bagram for medical treatment, where it was later discovered that he had been in the vehicle with the slain US troops. It added that in accordance with U.S. Department of Defense policy, the names of service members killed in action were being withheld until after the notification of next of kin. The Taliban claimed responsibility for the attack on Twitter, calling it a suicide bombing on a US armored vehicle. Following an assessment on scene, it was determined that the contractor, an Afghan national, had received initial treatment with other injured civilians, according to Operation Resolute Support officials. 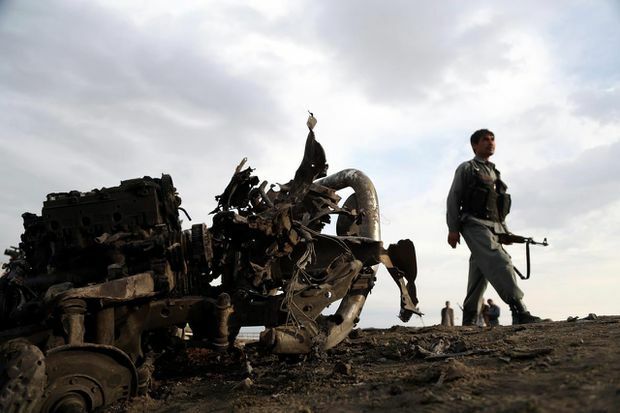 Abdul Shakor Qudosi, the district administrative chief in Bagram, said American soldiers opened fire immediately after their convoy was bombed. In February, the top U.S. envoy seeking to broker peace in Afghanistan met the Taliban's co-founder in an attempt to end the 17-year conflict. But the Taliban say they will not recognize any government official attending the gathering as a representative of the Kabul government, only as an individual Afghan participant.